I never talk about my age. Guess what. I totally loved it. That summer, seeing Warrant at the Boathouse started a very long list of concerts that would quickly come. Montley Crue, Skid Row, Aerosmith, Deff Leppard, Nelson (you get extra points if you remember Nelson.) I had found my calling. This was all I wanted to do. Go to concerts, all summer long. 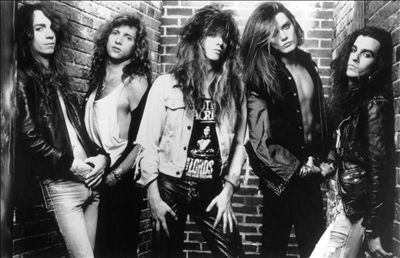 Skid Row was my favorite. To the point where one day in The Parents kitchen, while everyone was getting ready for dinner, I excitedly told them how I plan on marrying Sebastian Bach and I wanted to be a groupie. You could hear crickets. I wanted to be a groupie. Little ole virgin me had just announced to The Parents over dinner that my main goal in life was to marry Sebastian Bach, but first I must become a groupie. I always wondered why they did not support me in this new endeavor of mine. You may be shocked to hear I have lived a very sheltered life. I was 17 when I had my first boyfriend. I was home schooled. I was the shy girl who had no friends. So of course it made total sense that I should become a groupie, right? Funny thing. Did you know there is a difference between being a groupie and being a roadie? Well neither did I. Just to be clear, there is a huge difference. Prostitution to be exact. Imagine my surprise when I found out a groupie enjoys the company of men, well, enjoys the company of the band members…..okay, to be clear, a groupie is someone who will sleep with whoever it takes to meet the band members. This totally explains why The Parents were not supportive of me being a groupie, right?! Were they waiting for me to find out on my own? Did they know I would be totally embarrassed telling everyone I came in contact with that I was going to be a groupie for Skid Row? Or……and I had not even thought of this til JUST NOW, maybe they did not know the difference? Okay, I am reaching aren’t I? Perhaps it was my determination to be a groupie and later, Sebastian Bachs wife, that led The Parents not to clue me in on what a bad bad idea this was. Perhaps The Parents thought this was a “teaching moment” for me, and perhaps they figured if I was that determined to be a groupie and Sebastian Bachs wife, then maybe I first need to learn what exactly a groupie is. Another funny thing. I ended up getting pregnant just two years later. At the tender age of 19. Unfortunately, it was not by Sebastian Bach. And, I never became a groupie….or roadie. Shattered reams I tell you, shattered dreams.